Some players find the cushioning perfectly level. A high number of purchasers are pleased with these basketball sneakers. They state it’s perfect to wear on and off the court. Some are claiming that the shoe’s cushion is springy and responsive. The Curry One Low has a clean and stylish look that goes with everything, several comment. Most testers claim that the traction sticks like glue and holds up well on any surface. Several wearers are happy with the Anafoam upper. They say that it feels incredible, breaks in easily, and conforms to the foot nicely. Many observe that the shoe’s step-in comfort is so impressive that the Under Armour Curry 1 Low can be worn all day, every day. The fit is just superb, a few comment. For a low-top, this basketball shoe delivers the best lockdown and stability according to some. Players are happy that the same is true for the UA Curry 6. A small number of buyers comment that the shoes run half a size smaller, and they feel snug around the toes. The grooves pick up dust quickly so wiping frequently is necessary, a few complain. Like the Nike Hyperdunk X, a few players are not happy with the cushioning. They’re stating that because it’s dense, lacks impact protection, they feel like they’re walking on nails. More than a handful of users are disappointed with the Curry 1 Low’s quality. They are claiming that the toe box and ankle collar falls apart after a couple of months. A handful of users experience heel slip during play. If you liked how the mid perform on-court but prefer to play in low, then you should give the Under Armour Curry One Low a spin. Similar to the mid-top version, what you’ll get is a supportive upper, effective traction, and balanced cushioning. There is really no major flaw with the Curry 1 Low, so expect to get a stylish and excellently performing basketball sneaker when you cop a pair. A great addition to the young Curry line. If you liked the mids, you will like the lows. The Lows definitely stack up to their predecessors. I say this is well worth the money. With the Curry One selling like pancakes, Under Armour Basketball follows up on its success with a low-top model. Packed with UA’s most innovative technologies, the Under Armour Curry 1 Low boasts an adaptive Charged Cushioning system with a new Anafoam upper that guarantees comfort from the opening tip-off until the final buzzer. Cushion. Tailor-made for one of the NBA’s most unguardable players, the Curry One Low features an adaptive Charged Cushioning system that delivers a plush and responsive feel underfoot. The Charged foam converts impact into responsive quickness, perfect for sprinting and cutting. Traction. All throughout the outsole is a multidirectional herringbone traction pattern that supports both linear and lateral movements for superior control and court feel. Length and Width. The Under Armour Curry 1 Low is snug at the toes according to wearers who ordered their true sizes. They recommend going up half a size if you don’t like that snug feeling. Lockdown. Securing the foot is an external TPU heel counter that prevents sliding and ensures lateral support. Located below the midfoot is a TPU shank that provides additional stability. 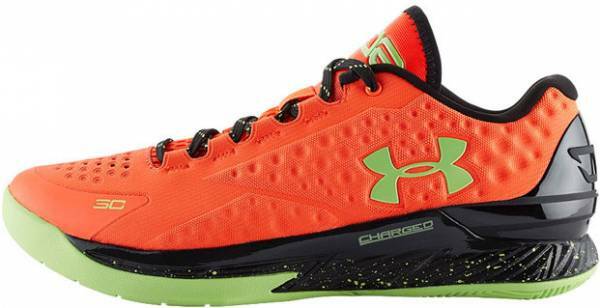 The Under Armour Curry One Low features an Anafoam upper that provides lightweight support and structure. The upper hugs your foot, delivering a body-mapped fit for all-game comfort. A padded mesh tongue bordered with synthetic suede adds a layer of protection while offering breathability. The 2015 NBA MVP and NBA World Champion is finding success on and off the hardwood with the popularity of his basketball sneakers. Stephen Curry’s first signature shoe goes low to complement the highly praised mid-top version. Paying tribute to Curry’s NBA squad and his favorite NFL team, the Curry One Low debuts in the Dub Nation and Panthers colorways.